The exit of the Metropolitan bay-coast express way area was newly completed at the Ishikawa-cho junction of the Metropolitan expressway, Yokohane line, on Wednesday, November 21. Direct access will make it much more convenient. It changed from a mere coastal line to well-known tourist spots in Yokohama such as Chinatown, Yamashita park, and Kannai district where main government agencies (Yokohama city hall, Kanagawa prefectural office) are clustered. UC-win/Road shows in great detail, the activities of possible access routes. 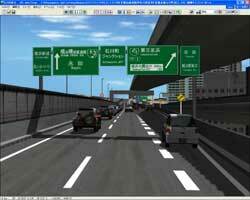 This VR simulation model has been used to announce and explain during their meeting, using displays of exit routes, signs and videos on the homepage. This project was open to the public at 15:00 on the day of the contest. 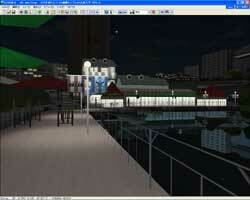 As compared to the actual scene on site, the validation results have been proven to be highly accurate. 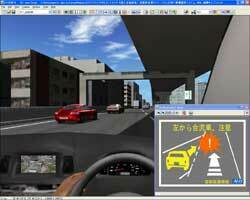 The future generation car navigation system can be shown in the drive simulation. 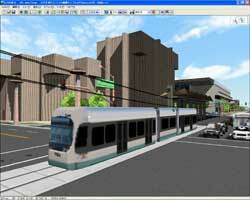 4 different scenarios: merging support, electronic sign, front obstacle information, hazard anticipation can be expressed. A real car driving experience on the Metropolitan highway was conducted at the event. 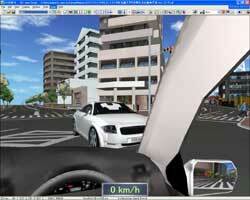 To measure the driving abilities of senior citizens, create a VR simulation data. 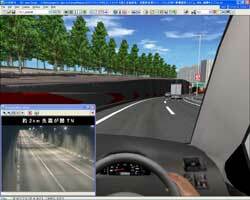 Express driving images by linking up a 3 monitor drive simulator with a high degree of precision. The system which can measure driving abilities of senior citizens, integrating the relevant features of the program like range of view is currently under development. 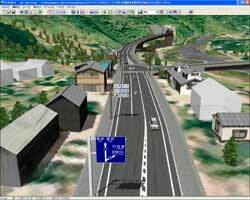 To promote a better understanding of the Asuke Bypass among the residents, which was scheduled to be ready next spring, we revised the VR data by creating the script of a round trip on Asuke By-pass. 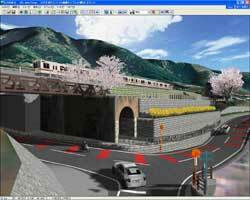 We made use of the characteristic of VR, which allows the realistic experience of the completed Asuke By-pass. The narration in dialogue can allow everybody from young to old to enjoy and understand the attractiveness of the Asuke Bypass. 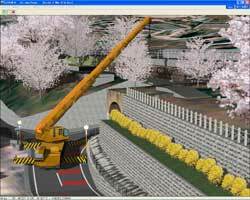 The utilization of VR simulation on tunnel construction and the simulated results by EXODUS, SMARTFIRE are expressed via UC-win/Road. Qingdao JiaoZhou bay tunnel construction is integral in connecting major zones in Qingdao city and areas located in town peripheries. The construction of this tunnel is anticipated to raise total profits by significantly improving the investment environment of the western island and promoting the rapid development of the economy of the new ward. 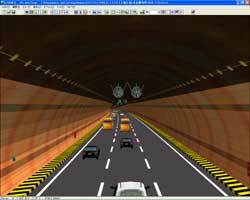 Qingdao JiaoZhou bay tunnel plays a big part in realizing its dream as a big international city. Huyo architect office Co., Ltd. 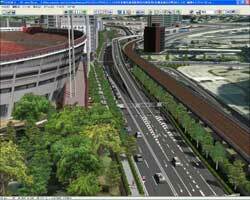 In the proposal of the JR Chuo Line Katsunuma budokyo station square, Kita-ku area park of Katsunuma-cho, Koshu-shi, Yamanashi, the simulation was carried out using UC-win/Road. A pedestrian bridge was erected on the old home site, allowing individuals to cross over a prefectural road with Jinroku cherry blossom trees. To build the bridge, the collective method was adopted by 225 tons of large-sized crane. 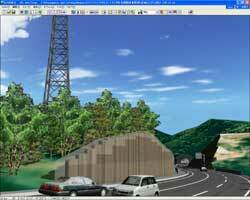 It was hypothesized that the impact of traffic on the prefectural road was minimal. We shall take a look at Katsunuma budounooka park, which includes lodging. This model was made to visualize the state of the phoenix inner-city in past, present, and future as part of the research project named "the digital phoenix". Different outlooks of the down-town in 2005, 2007, and 2009 can be observed by selecting past, present, and future options. In this project, a preset volume of 5000 cars were made to park in the parking lot of the international convention facility from the north, south, east and west entrances. Another situation involved the operation of the LRT in 10 minutes interval. 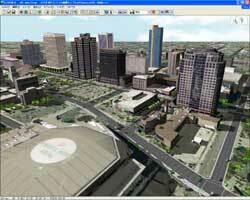 Different buildings, blocks and city design can then be evaluated. Research took into consideration, ecology and history, during the construction of the trench and surrounding environment. A sustainable design and characteristic restoration, in addition to the expansion of Ichigaya where faculty of Engineering and Design is, was planned. 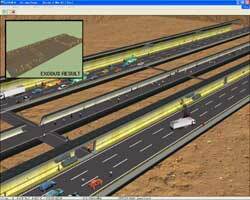 VR data, with the primary focus on the external trench was created with a high degree of precision. The renovation of the faculty is in line with the college song "catch fireflies at the trench outside the gate"